After making the ultimate sea change from Sydney to Lord Howe Island with her husband,Luke Hanson, and young daughter in September 2010, Dani Rourke, mother, daughter, blogger and 6th generation Lord Howe Islander, is settling into island life and reaching out to a new generation of working mothers and travel lovers in her new blog; www.ultimateseachange.blogspot.com and www.twitter.com/PinetreesLodge. Leaving behind successful careers in law and ecology in Sydney, Dani and Luke are now bringing new energy to the largest and oldest of the traditional guest houses, 120 year old Pinetrees Lodge on Lord Howe Island. They are also learning, often the hard way, about the challenges of running a business and raising a family on a sub-tropical island. "Although we are less than 2 hours from Sydney, we don't have mobile coverage on Lord Howe, so it can seem a world away. My blog and twitter account have been a great way to connect with other working mums, families and travel lovers and share experiences. I have received so many messages from people who have visited Pinetrees in the past. It has been great to reach others who have never heard of Lord Howe before. We can't resist including a few restaurant updates, surf reports and photos of our beautiful sunsets as well". Established in the 1890's, generations of Dani's family have been receiving guests with Dani's mother, Pixie Rourke and her sister, Kerry McFadyen running Pinetrees with their husbands from 1976 until Pixie's death last year in July 2010. Dani has now followed in her mother's footsteps, running the lodge and giving her own children the opportunity to grow up on World Heritage listed Lord Howe Island and enjoy a simple, old-fashioned childhood. Dani comments; "I have wonderful memories of my childhood on Lord Howe - going to school barefoot and riding my bike everywhere. I hope that my kids can have the same relaxed, uncomplicated childhood. We still ride around on bikes, swim in the lagoon and go fishing for our dinner. However with our second daughter, only born on the 9th of March I am sure things will change again!" Dani Rourke with her husband Luke Hanson and other family members continue to provide the personalised service and relaxed family atmosphere that Pinetrees Lodge is famous for, while also bringing a new vision and fresh energy to the business. With Dani's venture into social media, Lord Howe Island promises to be a great destination for a new generation of families and travel lovers. "To think that guests first came here by trade steamer in the 1890's and now we have daily flights and are able to send out our news in short twitter updates and blog stories is amazing. As a working mum and blogger, I'm hoping to share ideas and swap stories with other mums who are managing the work/family juggle and those who are curious about living, holidaying and working on a sub-tropical island with a young family". Lord Howe made the top spot on Australian Traveller's ultimate bucket list! Question: Why did you decide to move from Sydney to Lord Howe Island? 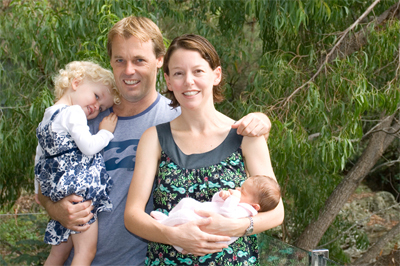 Dani Rourke: After living in Sydney for many years, we were ready for a change and we wanted to spend less time in our cars and in front of the computer and have more time with our kids. Luke and I had always talked about moving home to Lord Howe Island when we had kids, as I grew up there myself when I was a child. My family have been on the Island for 6 generations ,working at the island's oldest guest house, so it has a history for all of us. Lord Howe is stunningly beautiful, unspoilt, friendly and safe - it's the perfect place for kids to grow up. There were lots of good reasons to move to Lord Howe, but sadly one of the main reasons we moved when we did was that my mum, Pixie Rourke, was dying and I wanted to be at home with her. Pixie died at home on Lord Howe Island in July 2010. Question: Can you talk about the difficulties involved in making the ultimate sea change? Dani Rourke: The hardest thing has been the sheer number of changes we have made in a short period of time. I suppose that's what a sea change is! My mum died and it was a miserable time for all of us. We moved house three times - first to Luke's parents' house, then to my dad's house and finally into our place at Lord Howe. Elsie's, (my 2 year old), routine went out the window. We both changed career. I escaped from my job as a lawyer and Luke left behind a career as an ecologist. Although I grew up at Pinetrees, neither of us had any substantial experience in hospitality. For the first few months, whenever someone asked me what to do about a problem, I said: "What do you recommend?" and tried to keep a straight face. At around the same time, I discovered that I was pregnant again. Our second little girl, named Pixie after my mum, was born on 9 March 2011. When I go home to Lord Howe next week, I'm going to have to work out how to juggle a new baby, a toddler and a new business - a whole new set of difficulties. Wish me luck! Question: How have you overcome those difficulties? Dani Rourke: It takes time to settle in, make friends and feel comfortable. After six months, I'm happy living at Lord Howe, I know a bit more about the business and I'm thrilled to have a new baby as well as a (mostly) delightful toddler. I still miss my mum. I'm a natural worrier, but in my rational moments I think the way to overcome any difficulty is to take one day at a time. Question: What are the main differences between Sydney and Lord Howe Island? Dani Rourke: Lord Howe Island is less than two hours from Sydney, but it seems like a different world. The Island is incredibly beautiful. There are dramatic mountains, huge banyan trees and lush subtropical palm forests, beautiful beaches and a sheltered lagoon with the most southerly coral reef in the world. It's also a small and vibrant community, a bit like a small country town in the middle of the ocean. The permanent population is around 350 people. Everyone knows everyone and if they don't know something about you, they happily make it up. So much gossip! Seriously, though, people at Lord Howe are friendly, resourceful and always willing to help each other. There's no mobile phone coverage on the Island. Supplies come in every fortnight on a ship from Port Macquarie. Island people collect their own rainwater as there's no central water supply. There's only about 5km of road the speed limit is 25km per hour. Everyone waves at each other and the visitors quickly learn to wave too. Question: Why did you originally decide to begin your blog? Dani Rourke: I wanted to connect with other women and travel lovers through my blog and give people an idea of what it is like to live on a tropical island with a young family. Many people commented on what a big change it would be for all of us, so I named it the 'ultimate sea change'. I also spend a lot of time talking to our guests and it always surprises me that they are so interested in the practical details of Island life, so I thought I would write about it. They ask where our produce comes from, how we find staff and what happens to the garbage. Most of our guests come from big cities and I suppose Lord Howe seems so different and so remote. Also, I like writing and in a small community there's always plenty of material. I spend all day working and running around after a toddler so writing a few paragraphs late at night is a small, private pleasure. Question: What is the best thing about your children growing up on Lord Howe Island? Dani Rourke: I hope that they will be able to have the sort of old-fashioned childhood that I had at Lord Howe Island in the 1980s. They'll be able to ride their bikes to the fantastic primary school, the most remote school in NSW. They won't wear shoes much (in fact, bare feet are still the official school uniform). Over the last few years, there's been something of a baby boom at Lord Howe. There are now more than 30 kids aged under 5 on the Island - so they'll have lots of friends. They'll enjoy the beautiful beaches, surfing, fishing and climbing trees. Question: Can you talk a little bit about the Pinetrees Lodge, that you now run? Dani Rourke: Pinetrees has a boatshed and deck right on the Lagoon Beach where our guests gather in the evening to have a drink and watch the sun set over the ocean. Our chefs serve fantastic meals - including fresh Lord Howe fish most nights. The accommodation is comfortable but very simple. There are no TVs, no Wi-Fi and no locks on the doors. Pinetrees is a great family holiday. Once you arrive, there's no shopping, no cooking and no washing up. There's plenty for kids to do - riding bikes, swimming, surfing, snorkelling, fishing and walking - and they very quickly make friends. Families have time to do things together - and time to talk. One of the things that makes Pinetrees so special is the number of guests who return every year for a week or two. It's like being part of a big extended family. One of our guests last summer has two daughters in their late teens. When I asked her how many years she had been coming to Pinetrees, she replied that her younger daughter took her first steps on the Pinetrees lawn and the family has returned to Pinetrees every year since then. Question: What is your vision for the Pinetrees Lodge? Dani Rourke: There are lots of things that Luke and I and our partners, Rachael and Jim McFadyen, want to do to improve Pinetrees. We'd like to modernise and improve the accommodation and offer different packages to attract new people to Lord Howe. Pinetrees is a food destination, and we'd like to build on that by growing more of our own organic produce. We won't change the friendly, relaxed atmosphere at Pinetrees. There are fewer and fewer places in the world where you can have a real break. Almost everywhere has mobile phone access, flat screen TVs and Wi-Fi. Lord Howe Island is a rare place, only two hours from Sydney or Brisbane, where you can escape the modern world. 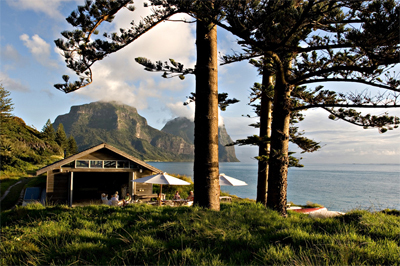 Our regular guests want to keep Pinetrees and Lord Howe just as they are. Question: Why do you value the fact that Pinetree Lodge is one of the oldest family businesses in Australia? Dani Rourke: My family has operated Pinetrees as a guest house since the 1890s. My mother, grandmother, great-grandmother and great-great-grandmother looked after guests at Pinetrees. I wanted to be a part of that tradition, and it was an important factor in our decision to move to Lord Howe. We have a wonderful connection with our guests. 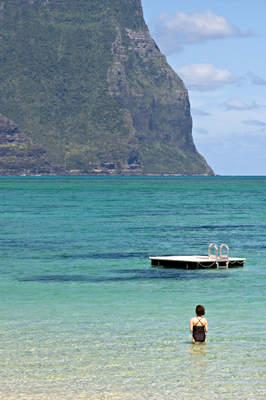 Some of our regular guests first came to Lord Howe Island as children. In those days, they travelled by flying boat or ship and stayed several weeks. They remember my grandmother and the tennis parties and fancy-dress dances that were an important part of holidays in those days. They still come to stay at Pinetrees - and they now bring their children and grandchildren. Question: What do you know about Lord Howe Island, that most don't? Dani Rourke: Lord Howe's natural beauty is well-known. Most people don't know much about its human history and the lives of some of the people who've lived there. You can spend a fascinating morning in the Lord Howe Island Museum or just wandering around one of the family cemeteries. My great-grandmother's brother, Albert, was the eldest of ten children. He didn't get along with his family and apparently kept a bonfire ready to light on Blinky Beach so that he could attract a passing ship. He eventually managed to leave the Island on a ship without saying goodbye to his family. He sailed for England, and took up a position on the Titanic. He died when the Titanic went down in 1912.